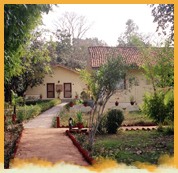 Located within walking distance of Bandhavgarh National Park's main gate, the lodge had been developed on the theme of an Indian village, with twelve thatched twin-bedded cottages around an innercourtyard. There are two separate villas with further accommodations of eight rooms. A spacious thatched dining room serving home cooked Indian food and Continental cuisines, becomes the center point of activities like campfire performances, lectures and star gazing. The estate has meadows that attract deer and fruit trees that are home to birds and butterflies. An occasional alarm call from the jungle close by , alerts you to the tiger on the prowl ! The Jungle lodge provides a professional naturalist, an extensive library with wildlife books and magazines. Laundry services and recreational activities are also available. Jungle safaris in open 4x4 vehicles, bird watching, nature walks and elephant camps, and visits to the village and school or weekly market and fair. Bar-be-que dinners and camp fire nights with tribal dances are some of the surprises in store for you ! The resort restaurant severs Indian, continental and Chinese cuisine delicacies. Room services and laundry services are also available. Above package is for 02 nights & taxes will extra. Above JPAI package for foreign nationals includes: (all 03 meals + 02 jungle safari per day by exclusive jeep).